The privatespaceflight firm SpaceExploration Technologies (SpaceX) will have to wait at least one more dayto launch its secondFalcon 1 rocket after a last-minute glitch prevented a Monday attempt. A launch rangetelemetry issue cropped up less than two minutes before the Falcon 1 rocket'splanned 7:45 p.m. EDT (2345 GMT) liftoff, prompting the booster toautomatically halt its launch procedures, SpaceX officials said. The launch isnow targeted for no earlier than Tuesday at about 7:00 p.m. EDT (2300 GMT),they added. "The vehiclebasically self-aborted," Gwynne Shotwell, SpaceX's vice president for businessdevelopment, told reporters after the glitch. Shotwellsaid that about 90 seconds before liftoff, flight controllers typically shift theircommunications with the Falcon 1 rocket from a land line system to a rangeradio frequency (RF) at SpaceX's OmelekIsland launch site on Kwajalein Atoll, which is located in the Marshall Islandson the Pacific Ocean. "It'spossible that we were not picking up the range RF signal," Shotwell said. SpaceX hasdaily opportunities to launch the Falcon 1 rocket through March 22, with eachday offering a four-hour flight window that opens at about 7:00 p.m. EDT (2300GMT), the El Segundo, California-based firm has said. The plannedspace shot, dubbed DemoFlight 2, is a demonstration mission for the U.S.Defense Advanced Research Agency (DARPA), which funded SpaceX's ill-fatedFalcon 1 launch debut on March 24, 2006. Since that first unsuccessfultest, engineers have made a series of rocketand ground support equipment improvements to prevent similar mishaps onfuture flights, SpaceXCEO Elon Musk has said. 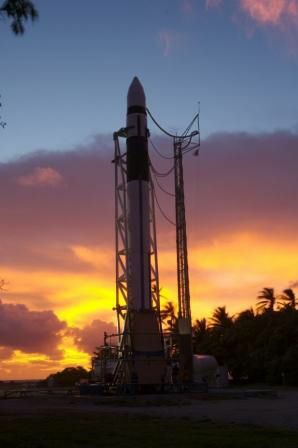 Monday'slaunch attempt was initially targeting a 7:00 p.m. EDT (2300 GMT) liftoff, buta telemetry relay glitch between SpaceX's Kwajalein Atoll site and California headquarters prompted a 45-minute delay. SpaceX'sFalcon 1 rocket is a two-stage booster designed to haul payloads of up to 1,256pounds (570 kilograms) into low-Earth orbit for about $7 million per flight.The rocket's reusable first stage is powered by SpaceX's home-grown Merlin 1 engineand designed to make a parachute landing in the Pacific Ocean after separationfor later recovery and refurbishment. Ridingaboard the current Falcon 1 rocket is a 110-pound (50-kilogram) package includingtwo experiments -- an autonomous flight safety system and a low-cost trackingand data relay satellite transmitter -- as well as mechanical adapter designedto connect satellite payloads with the booster's second stage. DemoFlight2 is the first of at least three Falcon 1 missions scheduled for 2007. For those subsequent flights, SpaceX is preparing to launch the U.S. Naval Research Laboratory's TacSat-1satellite this summer, and loft the Malaysian Earth-observation satellite Razaksatlater in the year.